Equipment: 20″ F/5 Newtonian with 13mm Ethos, 35mm Plossl (Russell Optics), 35mm Deep View (Orion), “Red Light Box” software, i-Pad (for backlighting the tracing paper). Weather: Excellent Transparency and Seeing on all dates. 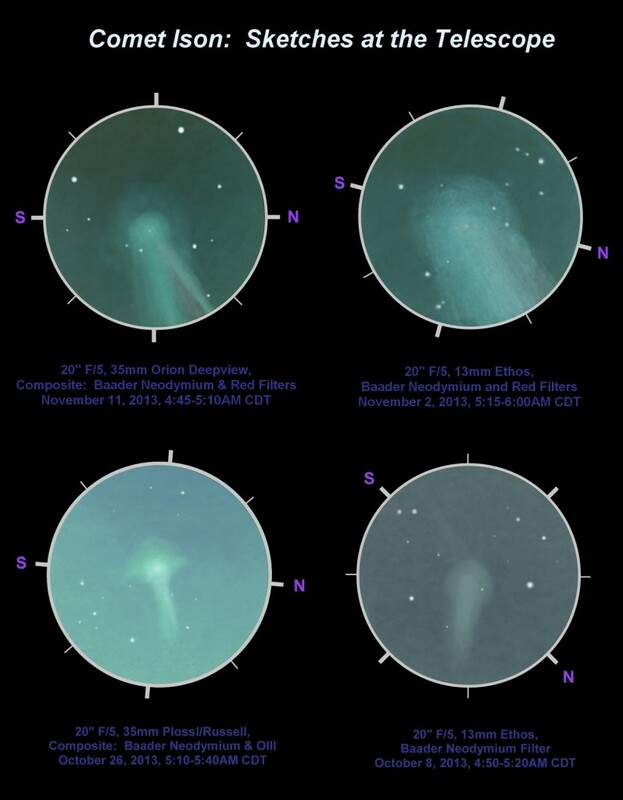 These four sketches show the evolution of Comet ISON over time during October-November 2013. At first, the comet was barely visible. No nucleus or dust tail could be discerned, but over time they became apparent. Each drawing is a stack of individual black and white sketches using the indicated filters. They were edited and stacked using Photofiltre and Canvas software. Wonderful details in your sketches of ISON. Thanks for posting it. A very nice time sequence for a much anticipated comet.